In previous posts, I’ve mentioned my granny’s best friend. We call her Ammachi and have known her all our lives. Granny and Ammachi call each other ‘Anni’ – which translates to ‘elder brother’s wife. I suppose this was their way to ensure neither woman misbehaves with their respective husbands. It’s the perfect solution to an age-old problem – make your husband your best friend’s brother and you’ll never have to fear her charms! Anyway, I digress. Ammachi’s sambar is the best I’ve ever had. I’ve tried making it in the past, but never gave it due justice because I made it from memory and would make things up as I went. I found my old recipe notebook, and realised that I had her sambar recipe noted down. This afternoon I thought I’d make it exactly as the recipe to see if it turned out just as tasty. The end result was fantastic. I doubt it’ll ever be as tasty as Ammachi’s, but this was pretty close. Pressure cook (a) ingredients. Once cooked, use a whisk and stir well. This will help the vegetables and dal to break down. Heat ghee in a pot, add onions, hing, dried chili and salt. Fry until soft. Push onions aside, add a little more ghee if required. Add mustard seeds, fenugreek seeds and curry leaves. Allow to cook until mustard seeds pop. Remove from heat. Add all the ingredients in (c) to the fried spices. The water helps deglaze the pot. You don’t want to waste all the good flavour from frying the onions in ghee. Add this mix to the cooked dal and vegetables. Add more water if required. You don’t want the sambar too thick. Bring the sambar to a light boil. Stir well. 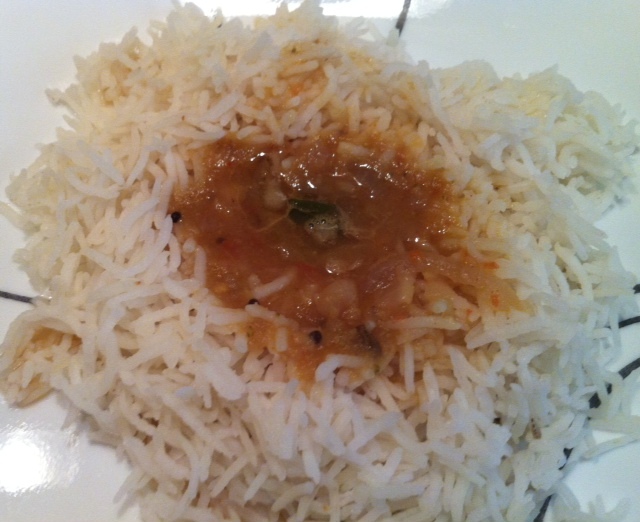 Serve with hot rice and ghee. Enjoy! As the sambar cools, it will thicken. Just add water as required.